Absolutely agree Jenna! Well done! I'm all about that steaming life as well!! I actually don't own an iron anymore cause how it's so much more convenient and faster to steam my clothes. I love how it does a much better job than what my old iron did. Awesome tips. I totally agree that some items need a little extra care, even if that means washing by hand! Girl you really need one in your life! Oh I wish I was the same haha! I feel like I really need to start doing the things in this guide - it'd definitely make my clothes be nicer for longer! Glad you found it useful Amy! Such a great post, thanks for all the tips! i've never tried a fabric shaver before! sounds like a great idea! i should get one asap! i really hate those little bobbles that build up on sweaters! This is such a great post, lovely tips! I agree that there are pieces that need extra care, but if they are beautiful, I don't really mind to wash them by hand. It's really such a life changer! I live by steamers! They are the best!! Such helpful tips! I don't like ironing as well but that steamer looks really handy! These are such wonderful tips, especially the steamer and handwashing! I completely agree that you should think before you buy. I worked in luxury retail and it really got me into steaming my clothes and I have been using steamers for years now. Its so much easier than ironing. So sad I didn't discover it earlier! There's such a thing as a fabric shaver? Oh my, I need to get that! Girl yes! It's life changing! The perfect color isn't it! 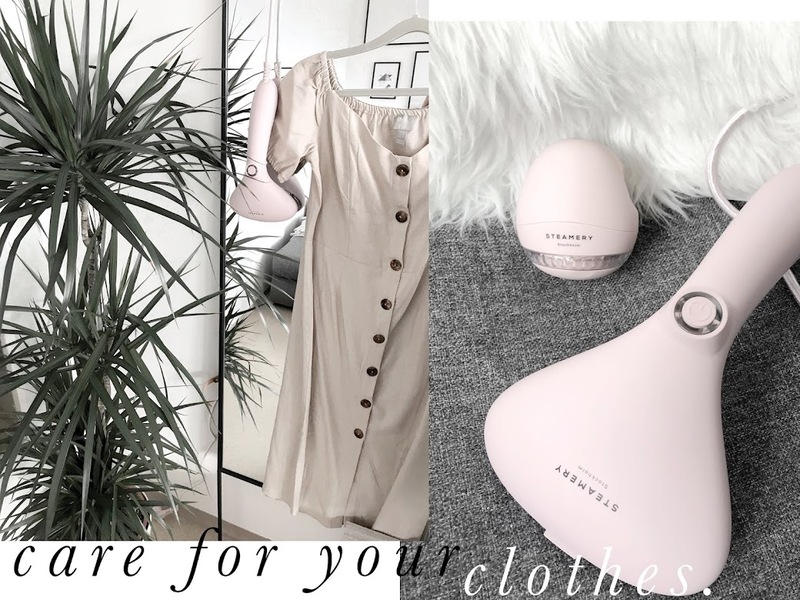 I used to work in a clothing retailer and we used to steam all of the clothes and it is so much better for them than ironing! This is the cutest steamer I've ever seen! Steaming is such a great tool, I cannot travel without without mine! I'll have ti try it!! Girl a clothing shaver will change your life! This is such a fabulous idea and much, much quicker than ironing haha. I love how effective these types of tools can be - definitely now heading for my wishlist! I sometimes doing handwash for some clothes that I love the most, well, thank you so much for the tips! I also think about purchasing a steamer. It´s so practical and fast. I freaking love that it's pink - functionality whilst looking fab! I seriously need a steamer in my life! It's such a shame when clothes you love get old and you cannot wear them anymore. touch ups are def important! sometimes clothes get worn out just by being left in the closettrynyewthings! Thank you so much Naya! Great tips. I recently bought a steamer myself and I really love it for lighter weight, delicate fabrics. I try to keep after my sweaters too with a de-fuzzer. It really keeps sweaters looking like new. have a great weekend. Those recommendations would help to taken care for my outfits then only washing and ironing. Yes ironing can be tricky for sure. I often thought about getting a steamer and this one is sooooo pretty. Checking it out! YAY let me know if you get one! Nice & helpful article. Thank you so much for sharing and to keep your point in the post. Cheers! I NEED THAT STEAMER IN MY LIFE! You do! It's literally amazing!